In the world of feather and down, it's important to know what different percentages of fill content mean. 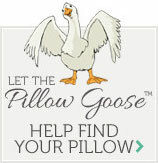 Essentially, the higher percentage of feather, the more supportive the pillow will ultimately be. This Cloud Nine Comforts ® is the perfect example. Having a 90% feather content, this Cloud Nine Comforts ® pillow offers more substantial support than it's higher down-filled counter parts. To remaining 10% of the pillow is filled with sumptuous down clusters to provide just the right amount of softness and loft. The blend of comfort and support in this pillow make it soft, yet ample enough to create an ideal position for both side and back sleepers alike.